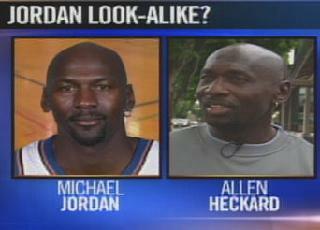 Lawsuit.no: An idiot sued Michael Jordan because he says Michael Jordan looks like him. This supposedly causes people everywhere to approach him. An idiot sued Michael Jordan because he says Michael Jordan looks like him. This supposedly causes people everywhere to approach him. He sued Michael Jordan AND the founder of Nike, Phil Knight, for $832 million dollars. And guess who was the lawyer representing this moron? Himself. You know your multi-million dollar case is retarded when you can't even get a lawyer. If this dude had even 1 braincell, he would use his Michael Jordan look-alike status to make money. Like by standing in Times Square in New York City and selling autographs to stupid tourists. Or by getting free meals at every restaurant. Obviously this numbskull enjoys the attention because he shaves his head like Michael Jordan and also wears an earring. Hey dope! You can't sue somebody because you look like them! This would be like if Rosie O'Donnell sued the moon. Or if Paris Hilton sued an anorexic pelican.